Residential buildings account for a significant amount of the national energy consumption of all OECD countries and consequently the EU and the Netherlands. Therefore, the national targets for CO2 reduction should include provisions for a more energy efficient building stock for all EU member states. National and European level policies the past decades have improved the quality of the building stock by setting stricter standards on the external envelope of newly made buildings, the efficiency of the mechanical and heating components, the renovation practices and by establishing an energy labelling system. Energy related occupancy behavior is a significant part, and relatively unchartered, of buildings’ energy consumption. This thesis tried to contribute to the understanding of the role of the occupant related to the energy consumption of residential buildings by means of simulations and experimental data obtained by an extensive measurement campaign. The first part of this thesis was based on dynamic building simulations in combination with a Monte Carlo statistical analysis, which tried to shed light to the most influential parameters, including occupancy related ones, that affect the energy consumption and comfort (a factor that is believed to be integral to the energy related behavior of people in buildings). The reference building that was used for the simulations was the TU Delft Concept House that was built for the purposes of the European project SusLab NWE. The concept house was simulated as an A energy label (very efficient) and F label (very inefficient) dwelling and with three different heating systems. The analysis revealed that if behavioral parameters are not taken into account, the most critical parameters affecting heating consumption are the window U value, window g value, and wall conductivity. When the uncertainty of these parameters increases, the impact of the wall conductivity on heating consumption increases considerably. The most important finding was that when behavioral parameters like thermostat use and ventilation flow rate are added to the analysis, they dwarf the importance of the building parameters in relation to the energy consumption. For the thermal comfort (the PMV index was used as the established model for measuring indoor thermal comfort) the most influential parameters were found to be metabolic activity and clothing, while the thermostat had a secondary impact. The simulations were followed by an extensive measurement campaign where an in-situ, non-intrusive, wireless sensor system was installed in 32, social housing, residential dwellings in the area of Den Haag. This sensor system was transmitting quantitative data such as temperature, humidity, CO2 levels, and motion every five minutes for a period of six months (the heating period between November to April) and from every room of the 32 dwellings that participated in the campaign. Furthermore, subjective data were gathered during an initial inspection during the installation of the sensor system, concerning the building envelope, the heating and ventilation systems of the dwellings. More importantly though, subjective data were gathered related to the indoor comfort of the occupants with the use of an apparatus that was developed specifically for the SusLab project. This gimmick, named the comfort dial, allowed us to capture data such as the occupants’ comfort level in the PMV 7 point scale. In addition further comfort related data like the occupants’ clothing ensemble, actions related to thermal comfort, and their metabolic activity were captured with the use of a diary. The subjective data measurement session lasted for a week for each dwelling. These data were time coupled real time with the quantitative data that were gathered by the sensor system. The data analysis focused on the two available indoor thermal comfort models, Fanger’s PMV index and the adaptive model. Concerning the PMV model the analysis showed that while the neutral temperatures are well predicted by the PMV method, the cold and warm sensations are not. It appears that tenants reported (on a statistically significant way) comfortable sensations while the PMV method does not predict such comfort. This indicates a certain level of psychological adaptation to occupant’s expectations. Additionally it was found that although clothing and metabolic activities were similar among tenants of houses with different thermal quality, the neutral temperature was different. Specifically in houses with a good energy rating, the neutral temperature was higher than in houses with a poor rating. 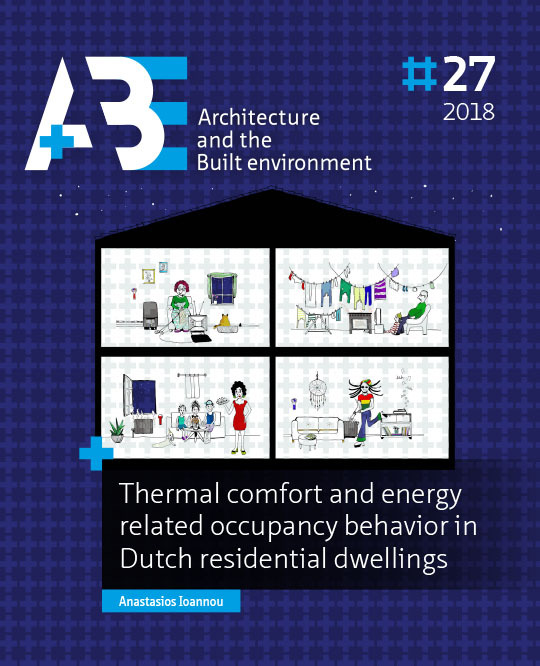 Concerning the adaptive model, which was developed as the answer to the discrepancies of Fanger’s model related to naturally ventilated buildings (the majority of the residential sector), data analysis showed that while indoor temperatures are within the adaptive model’s comfort bandwidth, occupants often reported comfort sensations other than neutral. In addition, when indoor temperatures were below the comfort bandwidth, tenants often reported that they felt ‘neutral’. The adaptive model could overestimate as well as underestimate the occupant’s adaptive capacity towards thermal comfort. Despite the significant outdoors temperature variation, the indoor temperature of the dwellings, as well as the clothing of the tenants, were largely constant. Certain actions towards thermal comfort such as ‘turning the thermostat up’ were taking place while tenants were reporting thermal sensation ‘neutral’ or ‘a bit warm’. This indicates that either there is an indiscrimination among the various thermal sensation levels or alliesthesia, a new concept introduced by the creators of the adaptive model, plays an increased role. Most importantly there was an uncertainty on whether the neutral sensation means at the same time comfortable sensation while many actions are happening out of habit and not in order to improve one’s thermal comfort. A chi² analysis showed that only six actions were correlated to thermal sensation in thermally poorly efficient dwellings, and six in thermally efficient dwellings. Finally, the abundance of data collected during the measurement campaign led the last piece of research of this thesis to data mining and pattern recognition analysis. Since the introduction of computers, the way research is performed has changed significantly. Huge amounts of data can be gathered and handled by evermore faster computers; the analysis of these data a couple of decades ago would take years. Sequential pattern mining reveals frequently occurring patterns from time-ordered input streams of data. A great deal of nature behaves in a periodic manner and these strong periodic elements of our environment have led people to adopt periodic behavior in many aspects of their lives such as the time they wake up in the morning, the daily working hours, the weekend days off, the weekly sports practice. These periodic interactions could extend in various aspects of our lives including the relationship of people with their home thermal environment. Repetitive behavioural actions in sensor rich environments, such as the dwellings of the measurement campaign, can be observed and categorized into patterns. These discoveries could form the basis of a model of tenant behaviour that could lead to a self-learning automation strategy or better occupancy data to be used for better predictions of building simulating software such as Energy+ or ESP-r and others. The analysis revealed various patterns of behaviour; indicatively 59% of the dwellings during the morning hours (7-9 a.m.) were increasing their indoor temperature from 20 oC< T< 22 oC to T> 22oC or that the tenants of 56% of the dwellings were finding the temperature 20 oC< T< 22 oC to be a bit cool and even for temperatures above 22 oC they were having a warm shower leading to the suspicion that a warm shower is a routine action not related to thermal comfort. Such pattern recognition algorithms can be more effective in the era of mobile internet, which allows the capturing of huge amounts of data. Increased computational power can analyse these data and define useful patterns of behaviour that could be tailor made for each dwelling, for each room of a dwelling, even for each individual of a dwelling. The occupants could then have an overview of their most common behavioural patterns, see which ones are energy consuming, which ones are related to comfort and which are redundant, and therefore, could be discarded leading to energy savings. In any case the balance between indoor comfort and energy consumption will be the final factor that would lead the occupant to decide on a customised model of his indoor environment. The general conclusion of this thesis is that the effect of energy related occupancy behaviour on the energy consumption of dwellings should not be statistically defined for large groups of population. There are so many different types of people inhabiting so many different types of dwellings that embarking in such a task would be a considerable waste of time and resources. The future in understanding the energy related occupancy behaviour, and therefore using it towards a more sustainable built environment, lies in the advances of sensor technology, big data gathering, and machine learning. Technology will enable us to move from big population models to tailor made solutions designed for each individual occupant.